Ford Australia's FPV division is giving the continent's muscle-car market a new blue-chip stock. 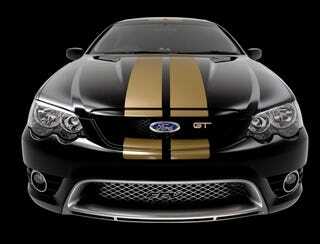 It's the Falcon GT 40th Anniversary edition, and it debuted this week at the Melbourne auto show. The hotted up Falcon is powered by FPV's take on the FoMoCo corporate 5.4-liter V8, known down under as the "Boss 290" — the 290 signifying kilowattage, or 389 hp. It also gets the new "R-Spec" suspension setup which involves modifications to the springs and dampers by suspension supplier Delphi, under orders from FPV's co-owner Prodrive. The Falcon GT40 also comes with an appearance package that includes leather/suede sports seats and 19" inch alloys with gloss black accents. Just the thing for outrunning marauding bands of dusty, Fosters-swilling ute bandits.